The past few days around Driggs have been so isanely beautiful, it's almost beyond words. I'll let the pictures do most of the talking, and simply narrate. 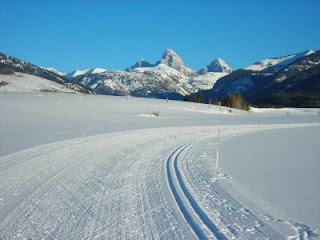 This first photo is from Monday afternoon, on the Alta ski trails, with the Tetons as background. Eight minutes from my office...does it get any better? 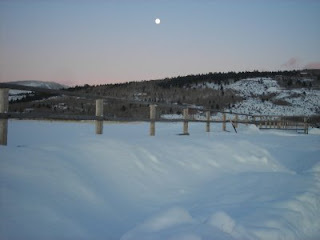 It was difficult to take in all the scenery and continue skiing, but I managed to make my way around the trails. I love the rolling terrain, sprinkler wheel lines, mountains-meet-Idaho farmland feel of this setting. The blue sky and unseasonably warm 38-degree temperatures didn't hurt, either. 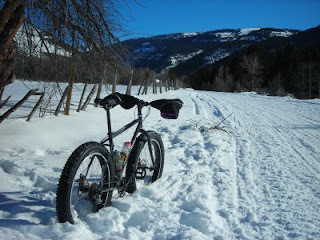 Saturday was my first real snowbike ride of the season (pathetically late, I know, but there are reasons). I feel like I had been experiencing winter as a window-shopper, until I jumped in and broke out my Surly Pugsley with 4" wide Endomorph tires. Destination was Darby Canyon, accessed just a couple of miles from my house, and the day was perfect. I like this canyon for many reasons (scenery, proximity, access to additional trails, etc. ), but especially because multiple-use seems to function unusually well in the area. Snowmobiles pack down the trail, which is then used by skiers, walkers and even freak winter cyclists like me. It was great to be out there. 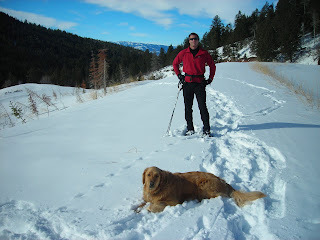 Sunday was a pre-Cardinals/Eagles snowshoe hike up Fox Creek Canyon, with Joanne & Bridger. We managed to find some nice relatively untracked snow, and got quite a bit of vertical. It was about as extreme as we wanted, given the current high-risk avalanche conditions. On several occasions , we had big slabs "settle" under our snowshoes, which is always a sober reminder. 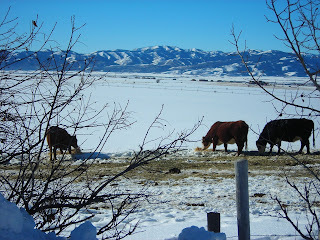 The serenity of cattle grazing on a sunny winter afternoon...I had to stop and capture the scene. Rural Idaho is alive & well. My legs need a day or two to recover now. After several weeks of relentless winter weather, the sun has suddenly appeared here in Teton Valley, Idaho. High pressure has moved in, bringing blue skies and daytime temperatures in the mid-30's. We can finally see where we're going on the roads, slopes and trails! 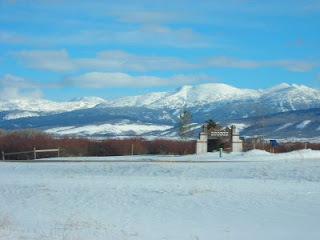 This photo shows the "Welcome to Driggs" sign on the south end of town, with Fred's Mountain and Grand Targhee Ski Area in the background. Meanwhile, the Upper Midwest and Northeast are under a deep freeze. I've got a small R.U. Outside crew back at the Eagle River, Wisconsin Snowmobile Derby Event this weekend, and let's just say it's cold back there. 30-below-type cold...I've been there & done that. My most enduring memory is looking out at the racetrack, and watching thousands of spectators trying to drink their beer before it froze. That's where I draw the line. 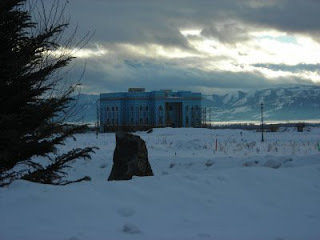 Elsewhere around Driggs, Idaho: the new County Courthouse continues to progress, and these moderate January temperatures are helping the cause. The location is just west of downtown, by the south entrance to the big new Huntsman Springs development. The approval process took several years (hey, it's three stories tall, consensus-building took time), but the result is looking good. We even had a clear night to observe the Full Moon last week. Sunny days and Moonlit nights certainly lift the spirits, any time of year. It's looking like another week before the next winter storm, so we'll enjoy the January Thaw reprieve for a while...and then start praying for snow again. Midwest friends: dress warmly, and carry a thermos. The older I get, the more I realize that the holiday season is all about faith, family and friends. Accordingly, this year we spent the entire Christmas-to-New Year's time with both close and extended acquaintances, and it was awesome. 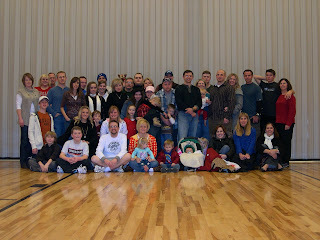 This photo shows what I'm talkin' about (and fittingly, it was taken on a basketball court). 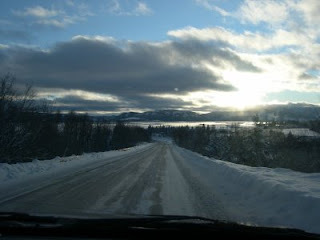 It was difficult leaving Driggs - literally, because the roads were sheets of ice and had been closed due to blowing snow. It took two hours to make the normally one hour drive to Idaho Falls, but we persevered and made it. Joanne even found occasion to take a photo. From I.F. south to Salt Lake wasn't too bad. If I had to pick a theme for the holidays this year (other than "yes, we're still in the guest room" and "lots of snowstorms"), it was Guitar Hero, courtesy of my nephews Blake & Tyler. Holy Cow it was fun, batman!! I now understand why kids are addicted to X-Box and Wii. 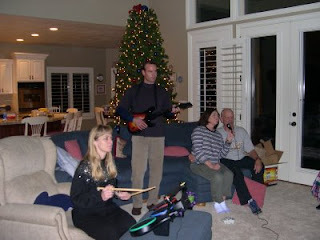 The kicker with Guitar Hero is its appeal to all ages...evidenced in this photo with Joanne knockin' the drums, yours truly rockin' the guitar, and mom & dad nailin' vocals. I won't say how many cumulative hours we played, but time sure flies. The highlight of the holidays? 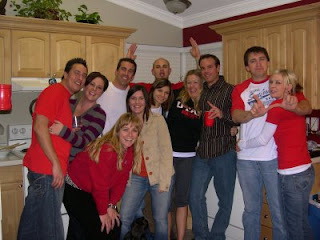 How 'bout my Utah Utes' huge upset victory over Alabama in the Sugar Bowl, baby!! Utah finishes as the only undefeated team in college football, with a valid claim to the number 1 national ranking (will there ever be a playoff format?). A great end to a season that was monumental for the school, the entire Rocky Mountain region, and mid-major colleges in general. The best part was the fact that it was a thorough whippin', with Utah dominating Alabama in every facet of the game: physical strength, skill, speed, coaching, and desire. We got together with friends and fellow U of U alums to watch (many of whom are season ticket holders), and man it was fun. Eventually, we made it back to Driggs...but not into our driveway without shoveling. The snowpack right now is the strangest I've ever experienced: light fluffy base, then ice, then heavy windblown snow on top. 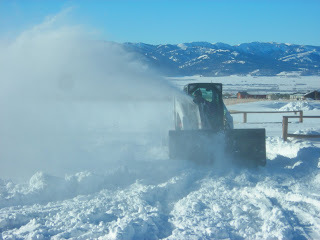 In all, it makes for very high avalanche danger (careful out there, y'all) and very difficult shoveling. Good thing I got the Bobcat running. One other detail: it was 20-below this morning. Happy 2009!